if you can offer help or assistance in any way. Tony Lalikos picked me up and brought me back from Church at (St. George Greek Orthodox Church). I did not attend St .Stephen's Orthodox Catholic Church out on Sumner Ave, (wanted to but I was so tired). It is so hard getting any rest unless I am exhausted. The doctors and nurses said to rest, so I will keep trying. I am so very weak these days.. I applied for food stamps, and used them up. I have cans of stuff I really do not know how to cook or I really do not like to eat much. I might check on a food pantry this week. PLEASE pray that God provide for me the income so I can get well and do the work He wants me to do. PRAY I am healed in mind, sprit, soul, body and be as HE wills! Sunday, October 18th and the Western Massachusetts Arthritis Foundation Walk. BUT YOU CAN STILL DOPNATE. 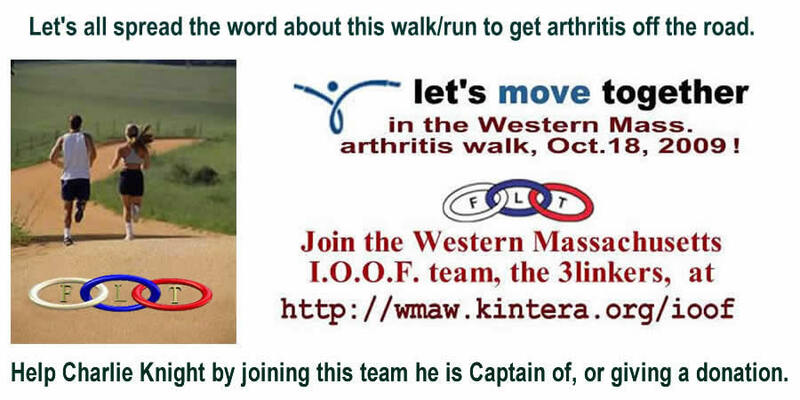 I was/am Captain of a team called the "3 linkers" (click on the name "three linkers" to see a card that can be printed to show the website address) and hope people reading this will come to the website at http://wmaw.kintera.org/ioof and join our team or donate to the cause and preferably both. More information is at this link, click on the image (or this link) to see and print it. If they want to they can send donations to me and I will put them on the website, all I ask is tell me if you want this to be made as a donation in the name of someone or some organization. Arthritis does not just cripple old folks, it hits hard also the young, like the 2 year old. Let's all get behind this and put Arthritis out of business in this country as we did Polio. Donate or Join the team today, help us reach our goal. We would like to raise over 500 dollars, but set our goal at $200 because not that many folks have joined us yet. Be a help to your community, join or give to the Arathritis Foundation through our team, the "3 linkers", it is NOT o late to donate. One last note. I have had "electric shocks" go through my body, and a tingling like you get when a portin of your body has "gone to sleep", which for me is almost all the time. I am scared. Please pray for me. Nerves like electric shocks. I am afraid that these things will be with me the rest of my natural life. I have made a tri-fold resume like a brochure, saved it as a PDF file,and gave it to the Food Stamp people in case they know of a job when I am able to work . I had many appointments and the people at MART for Pioneer Valley, paid for my MassHealth, have been wonderful at taking me to medical appointments and then getting me to bring me back to my apartment building. But I feel so guilty for taking this help at the expense of my family and friends taxes. I could have done all this with a bus card. The 29th we had a Halloween party at my building. I came and entered the costume contest. I got the consolation prize. It was a nice event two people brought cakes and we ate a gallon of ice-cream and drank about 8 or 9 liters of soda. Pam and Judy put up the Decorations and were the "party coordinators". Liz got the first prize and Cynthia the second prize. I walked from near the Streeter Funeral home on Baystate Medical Center and tried to do a MRI on the evening of the 31st at 9PM. It was to late to arrange a ride through MART, I only found out about it Thursday night. When I was there restless leg syndrome started up, about 9:45-10:15PM. Then the strangest thing happened. I started to vibrate, my hips moved, it was awful. 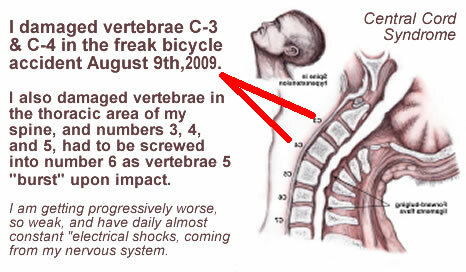 If someone knows what I will be experiencing with this Central Cord Syndrome I wish they would tell me. I wanted to stay still, but instead I bounced around. I wanted to walk up to the soup kitchen at the Seventh Day Adventist church, but I just felt to tired to do it. I miss my bicycle a lot. Got to get to the lodge and bring some stuff over and get my tools. I am so tired and weak and the pain is in my left arm and the tingling down to the thumb and pointing finger. 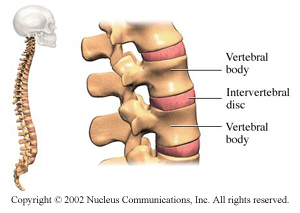 The neuro surgeon still wants to do surgery on my neck and take ot the intervertebral items and put something else in and fuse/screw these vertebrae in my neck, and there is a chance that if they do this, I will loose my ability to swallow. I have put in some drawings to show how the things should work, my brace was wrong so mine sticks out some.